According to the Puerto Rico Sate Historic Preservation Office register of historic places, this property was acquired and developed by immigrant Carlos Vasallo who arrived on the island shortly after the Royal Decree of Graces of 1815. The register indicates the house was built in 1849. 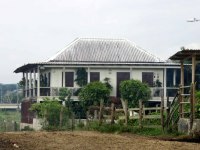 The sugar factory was established by Cipriano Nevares with approximately 60 acres of land, it was later owned by his son José Nevarez Rivera (1804-1863) and his wife Maria Ramona Marrero Cátala who grew the hacienda to approximately 300 cuerdas. At a date unbeknown to us, Media Luna was acquired by the firm Ceferino Nevarez & Brother, in 1881 Ceferino Nevarez Marrero (1837-1893) acquired the plantation from the insolvent Ceferino Nevarez & Brother and agreed to pay its secured creditors. In 1905 Ceferino's son José Nevarez Landrón acquired full ownership interest when he purchased from José Pons his interest in Media Luna. Its years of operation are not clear but according to José Ferreras Pagán in his 1902 book Biografía de las Riquezas de Puerto Rico , after its closure, its equipment was installed at Hacienda San José in Rio Piedras which later became Central Vannina. He also states that Media Luna's lands were leased to Central Luisa in Manati which was established in 1873 and apparently at a later date, processed at the nearby Central Constancia which was established in 1897. Ferrears Pagán states that by 1902 the factory facilities were in a bad state of disrepair. 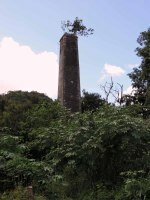 The smoke stack dates from 1861 and is located approximately 1 mile south of the house. Currently, the area around the smoke stack is not in use and the land surrounding the house are used as a cattle/dairy farm.